Bill and Andrei Allen give a lot of credit to DriveGuardian for keeping their drive intact for the entire 2017 season. In April, Marine Design Corp. shipped its 100th DriveGuardian, the drive protection component that got the ball rolling for Mike Clesceri and his team. Also in April, Clesceri left his ”day job” to focus all of his efforts on MDC, which features an expanding line of products, including the well-received DriveSync, a TrimSync, a Bravo Output Shaft, a Shift Control for SCS Crashboxes, an in-development patented self-regulating water pickup and more. Not only has Clesceri sold, advised, helped install and built a reputation for great customer service with his “smart” products like the DriveGuardian—the patented torque-limiting clutch designed to eliminate the torque spikes that occur when a boat hits a wave, catches air and the propellers re-enter the water—he’s also hit the pavement attending events in Missouri’s Lake of the Ozarks, Florida’s Key West and a plethora of offshore racing locations around the country. Along with churning out product and keeping boaters happier with their on-water experiences, MDC’s 2017 success lies in achieving tangible results—the racing world championships and the class victories at the popular Lake of the Ozarks Shootout in Central Missouri. The owner of this impressively updated 42-foot V-bottom from Statement Marine, Michigan’s Travis McDougall said he’ll never own another performance boat without DriveSync. 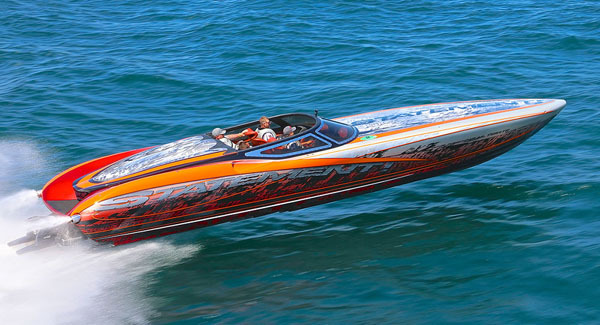 For example, the Factory Billet-canopied 51 GTX from Outerlimits Offshore Powerboats owned by Jim Schultz ran 161 mph down the event’s new three-quarter-mile course in late August to tie for fastest V-bottom in the top-speed contest. Powered by Factory Billet Power’s first pair of remarkable 1,650/1,950-hp engines (pump versus E-90 fuel) as well as the company’s automatic three-speed transmission and auto drive- and tab-trim system, Factory Billet engine builder Mike Faucher, who drove the boat with Schultz, installed DriveGuardian to complement the 51-footer’s Mercury Racing No. 6 drives. Clesceri said two other class winners used his equipment—the 2nd Amendment team runs DriveSync on its 36-foot Spectre catamaran and Allen Lawn Care and Landscaping uses DriveGuardian on its single-engine 30-foot Phantom. The father-and-son Saris Racing Team, which runs a 32-foot Cobra with a 650-hp engine from Saris Racing Engines, has been a proponent of DriveGuardian for several years. Clesceri said his drive synchronization system for twin- and triple-engine boats has been a major factor in the growth of MDC. In fact, the company now offers DriveSync in Sport and Race editions, which allow for two easily programmable presets that the operator can activate with the push of a button. The Sport edition offers a unique safety feature. With the incorporation of a GPS receiver, the system can be programmed to return the drives to a preset, and safe, trim level when a boat exceeds a predetermined speed. In essence, the system allows drivers to focus on driving and reduces the risk of being over trimmed at high speeds. Optionally, the system can deactivate the trim “up” buttons to prevent any accidental movement of the drives that could cause an issue at high speeds. The two preset recall buttons remain active so the operator can move the drives within the programmed window. 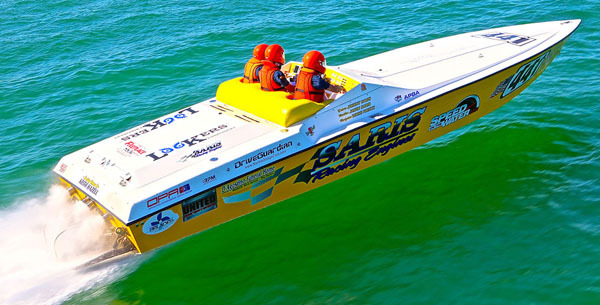 Offshore racer Bill Allen, who earned the Super Boat International Manufacturer P4 world championship earlier this month, said he heard about DriveGuardian from his engine builder—ATECO Engine and Dyno Shop in Illinois—and some friends and decided to give it a try on the team’s 30-foot Phantom. Allen wasn’t the only one with success in Key West. Clesceri said all four boats that were running MDC product won their respective classes—LSB/Hurricane of Awesomeness was victorious in Superboat Vee running DriveGuardian, 2nd Amendment won Manufacturer P3 national and world championships running DriveSync and Instigator/AMH Construction took the Superboat Extreme world championship running DriveSync Race Edition. From Skater Powerboats owners Travis Reed and Sam Tippens to Kenny Mungle of Team Gone Again fame and Kenny Adams, crew chief for the world champion Instigator/AMH Construction team, the list of satisfied customers goes on. There’s just not enough room to include them in this column so keep an eye out for future stories highlighting MDC products.